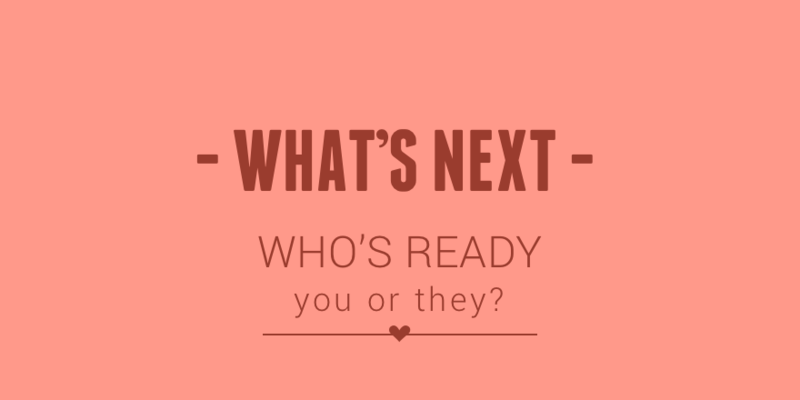 What’s next - who is ready, you or they? Our children have their own timetable for development. If we trust their inbuilt timing, we can resist the urge to ‘teach’, intervene, coax and prompt. We can instead put our energies into observing, noticing, appreciating and celebrating. Our focus moves to looking at what our child CAN do instead of what they can’t (yet). In almost all circumstances, our child WILL do all those things we are waiting for - moving, talking, toileting independently, when THEY are good and ready. The idea that we can speed up the development with gadgets, tuition, rewards is a widely held, but really sad one. Can we not just let our wee people unfold as they are meant to - in their own way, at their own pace? In that way their development is their own, not the result of us. They learn they are capable problem solvers and change agents, not just recipients of an adult’s ‘teaching’. What's next, do we have to look ahead? Our children’s earliest years go by fast enough. If we are always looking ahead to what’s next and how to get there quicker, we wish it away even faster. Our baby starts to roll and we start thinking of how can we now ‘get them’ to crawl? They utter first words and we go looking for sentences. We’re ready to detach training wheels no sooner than they learn to pedal a bike. Let’s press pause instead, and appreciate the present moment. Let’s trust, and go with what is, exactly as it is. If we feel redundant not having an active role, we just have to relook at what’s needed of us? If we don’t have to prop our babies to ‘teach’ them to sit, what do we need to do? We have a big role to play in fact - that of allowing the time and physical space for lots and lots of time unrestricted, on the floor. Baby will sit when ready, not because we taught them, but because we allowed them to follow their timetable. If we don’t need to take them to toddler literacy lessons to boost their vocab and ‘set them up’ for reading, what can we do? We can offer them life and love, natural conversation and stories, and marvel as their language falls into place, when and as it’s meant to. There are of course times when there may be a real concern, and genuine reasons things aren’t falling into place on their own. We need to trust our instincts here. If it doesn’t feel right, seeking support makes complete sense. The difference is that our inner voice, not society’s voice needs to guide us. Our society tends to rank, measure and compare children, without respect for the enormous variation of development rate. If in our hearts we feel our child is ‘ok’ we are very likely right. They just need time. Development isn’t steady, one measured step after another. Starts and bursts happen, they ‘aren’t’ and then all of a sudden they are. Let’s leave space for blossoming, trusting ourselves and most importantly, trusting our child before we look to intervene.